Look at this dangerous criminal. Stop me if you heard this one. 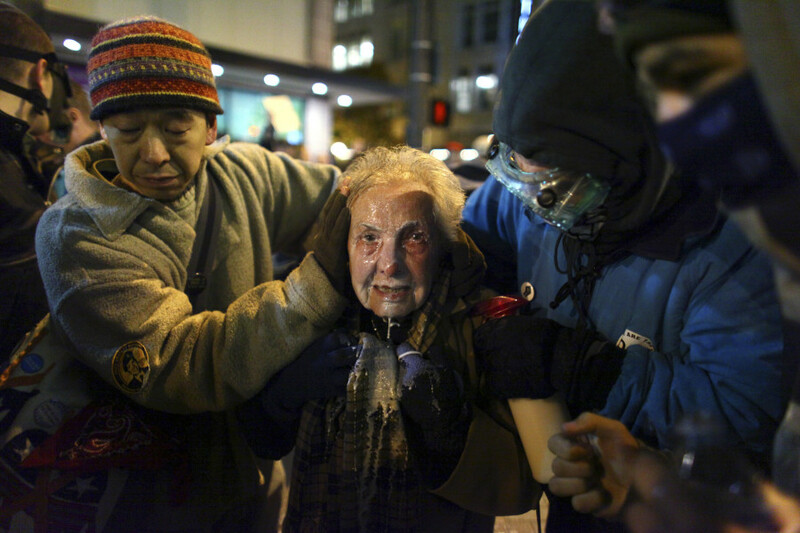 Last night a pregnant teen, an 80-year-old woman, and a priest were walking in a peaceful Occupy Seattle demonstration. When Seattle police officers, obviously over whelmed by the threat posed by this trio, subdued the peaceful protestors with pepper spray sending the teen mom-to-be to the hospital. If that isn’t bad enough they were bicycle cops, the special-ed branch of the long arm of the law. I would like to point out here that this is a public relations war and whoever is on the other side of the Occupation movements just lost big. Shooting a Oakland based ex-Marine in the head with a rubber bullet is nothing compared to this, I mean the old lady was only 4 foot 10 inches. This event comes after a few weeks of clam in the Seattle based solidarity movement of the Occupy Wall Street Protestors. This is manly due the police forcing the occupation to move from the Commercial center of Seattle’s Westlake district to a near by Community College. My message to the Seattle Police is that this is not your fight unless you make it so. If you look at the pictures from the local news website below there could not have been more than 50-100 protestors. Although, they were blocking the road there is not much damage caused by a peaceful march of this size other than a minor traffic inconvenience. The risk losing face and thus perpetuating the movement through publicity versus the benefits gained through knocking some 21-century hippies around is nil. Just let them protest until it is too cold out or they find something else to occupy their time, patience and time are the invincible warriors. Good thing they are wearing those gay helmets. All this leaves me asking, where were you Phoenix Jones?